Box Dimensions (LxWxH) 1.8 x 1.5 x 1.6"
Viewfinder for 75mm (Black) is rated 4.0 out of 5 by 5. Rated 5 out of 5 by Robert from Beautifully finished viewfinder I found that the 75mm focal length is a useful intermediate when 50 is too wide, and 90 is too close. This happens more commonly than I would have thought before I bought the 75mm lens. It is less expensive to obtain a fast 75mm lens vs a 90mm lens also. For LTM and M cameras lacking a 75mm frame line, this is a very nice finder. Even with my M7, this is useful if I want a quick preview without working the frame line lever. The chrome is immaculate. The view is sharp, and crisp with easily seen brightlines. The coated optics improve the view compared to some older viewfinders. There is no distortion in the view. Close-up parallax is corrected for by a dashed line at the top. Best of all, this finder is small enough to easily fit into a 35mm film can for storage and transport. It does come with a cloth satchel, but the fine cloth will not stand up to a lot of use/abuse, nor is it as protective or waterproof as a film can. 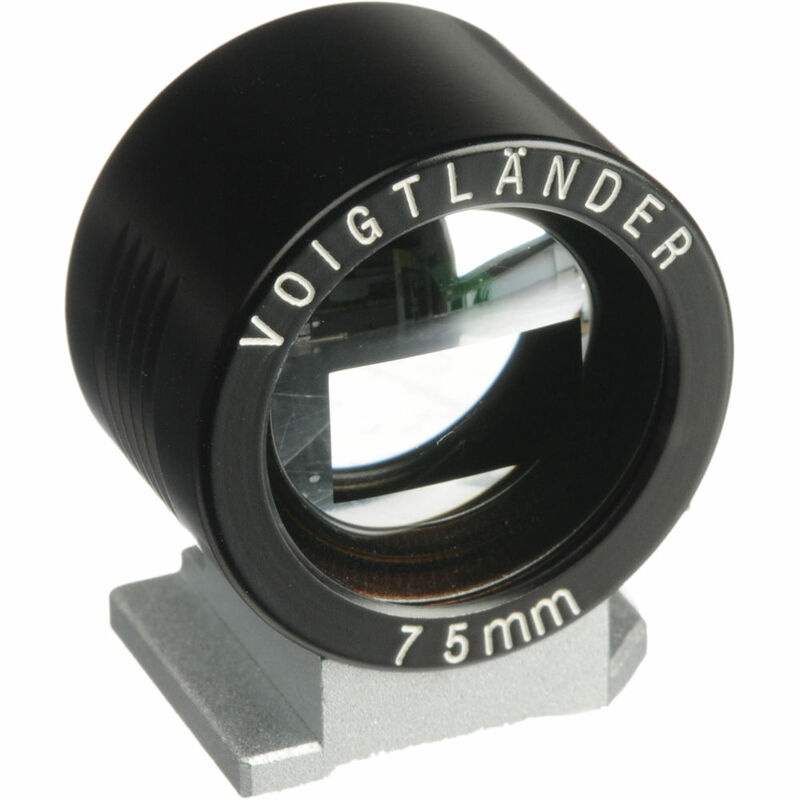 Lastly, this item is no longer in production by Voigtlander. If you want one, you should get it soon. Rated 5 out of 5 by frit from Form my Dp3 Just got this. It seemed expensive until I saw and used it. It's very nicely made. The parallax adjustment bright line works well. Huge upgrade for the Dp3 in non-macro mode. The little beep tells you when you've captured focus. Holding the camera to your face rather than far enough away to see the LCD makes a more stable shooting experience so you get longer exposures with less shake. Rated 5 out of 5 by ScottW from Excellent addition to the K-01 Having purchased a recent K-01 at the now new pricing I wanted a decent VF to use with my 50mm f/1.4 lens. This is typical Voightlander quality, the view is crisp and clear and parallax it is not an issue when slightly stopped and from ten feet and beyond. Set your focus point to center, frame your shot and you are all set. Just what I need on bright sunny days when the LCD is tough to see. If you need a 75mm VF I see no reason to look further. Rated 4 out of 5 by Anonymous from A good alternative to the Live-View Fits on my Sigma DP3M camera hot shoe, although it is needs some effort - but it sure will not fall out!In bright light it beats the Live-View screen for ease of framing and taking photos. But it is relatively expensive, but it does the job.It is much smaller than it looks here, as it needs to fit the hot shoe. When fitted it is similar to viewing through a compact camera viewfinder.